TONIGHT! A BENEFIT FOR TOM CARTER at ZANZABAR! 100% of all proceeds will be donated to The Robert Thomas Carter Irrevocable Trust. While on a tour of Europe this spring with his band Charalambides, the Brooklyn based guitarist Tom Carter was hospitalized in Berlin, Germany for serious complications of pneumonia. In mid-July, Tom was transferred to a medical rehabilitation facility in Germany, near the Baltic Sea. Tom will receive medical care, monitoring and physical rehabilitation at the facility until the end of July. His doctors are also recommending that Tom not return to employment and normal levels of pre-illness activity until January 2013. This recommendation will be periodically reevaluated, but it seems to fall in line with common recovery projections for people who have experienced pneumonia at this level of seriousness. It is still unknown whether Tom will be able to return to New York immediately after the rehabilitation, or if it will be necessary for him to, instead, reside elsewhere with his family for a time. Although his condition continues to improve, Tom is still weak and his condition must come closer to what his normal baseline health will be, in order for doctors to assess what type of further treatment he will need in the US. It does seem to be certain that Tom will require follow up care once back in the States. Tom Carter is a tremendous musician, and a caring, compassionate individual who will need long-term help to recover from his illness. Cropped Out, The Other Side of Life, and the musicians playing the benefit are joining forces with a number of promoters, musicians, and concerned friends of Tom all across the South to curate benefit shows during the middle of August. This unique situation of multiple forces across an entire region presents a rare opportunity to help a friend who has given us so much over the years — his music, friendship, and encouragement. Spawned from the formidable Louisville, KY collective known as Black Velvet Fuckere, SAPAT resides as the centrifugal force in this Midwestern psychedelic madrigal set in the psychosexual backwaters of the mighty Ohio River. For the entirety of the ‘00 decade, members have kept busy collaborating with and/or massaging the egos of various and sundry avant-pontiffs such as Robert Fripp, Magik Markers, Dead Child and Eugene Chadbourne – when not honing the orgone energy of SAPAT. TROPICAL TRASH have caused quite a stir with their new 7″, Fear of Suffering, on Sophomore Lounge. Still Single describes TROPICAL TRASH as an “Excellent combination of thrashing energy and solid ideas that break apart and recombine in novel, tuneful ways.” They’re just as thrilling live as on record, so don’t miss this opportunity to rock out with ’em! SHEDDING has been a solo vehicle for Connor Bell since 2001, and has released several items over those years available at Ocio and Hometapes. SHEDDING‘s music is meditative and still, eerie and unsettling — yet with a spectacular sense of melody. 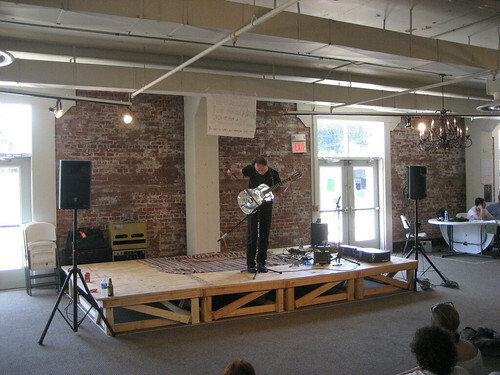 R. KEENAN LAWLER is a musician and sound artist based in Louisville Kentucky. For over 25 years his musical journey has taken him from early experiments with reverb tanks, noise and tape decks to all manner of avant-garde, “new” music, psychedelia, electro-acoustic, drone, ethnic and sampler-based work. LAWLER is best known for developing a highly personal and exploratory language for the metal bodied resonator guitar which Baltimore’s John Berdnt called “Cosmic, monolithic and deeply American.” Primarily a solo performer, he is also known for collaborative work. His guitar playing is also heard on releases by Paul K., Jack Wright, My Morning Jacket and on Matmos’ The Civil War. He has collaborated or performed with a wide range of forward-thinking musicians and mavericks including Rhys Chatham, John Butcher, Eliott Sharp, Charalambides, Ignaz Schick/Perlonex, Kaffe Matthews, Burning Star Core, Jason Kahn, Ut Gret, Thaniel Ion Lee, Ed Wilcox, Ramesh Srinivasan, Kevin Drumm, Arco Flute Foundation, Helena Espvall, Ian Nagoski, Connor Bell, Andy Willis, Alan Licht, Taksuya Nakatani, Tom Carter, Bhob Rainey, Aaron Rosenblum, Joe Dutkiewicz, Evergreen, Eric Carbonara and Joseph Suchy. Check out helptomcarter.org to see other ways that you can help contribute to Tom’s recovery! Find the Facebook invite here: http://www.facebook.com/events/428050753912799. To join our email list, send an email to hstencil@gmail.com. You can also join our Facebook group at http://www.facebook.com/groups/232825523444477/. UPDATE, 8/17/2012: Hey Louisville! We raised $475 last night to benefit Tom Carter and help with his recuperation from pneumonia. Thanks again to everyone who attended, played, or otherwise helped with the benefit, and thanks again to Zanzabar for hosting it.